We are Year Three kids who love to learn! Using this blog we will share some of our awesome thinking and learning with you this year. We hope you enjoy reading our page. Please leave us encouraging messages - we love to get feedback about our learning. The students in Room 15 made all sorts of delicious things. Anika made a yummy chocolate cake and bought it to school to share with the class! 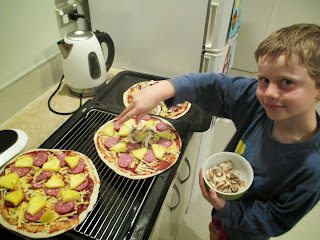 Bronson made dinner for his family, they had scrumptious pizzas. He took some pictures of his work in the kitchen for us to see too. Don't they look amazing!